Rowing may not be the first thing that you connect with a Sailing Club. However, the Stour Sailing Club has always been about promoting the use of the river for sailing and other activities. Club members are involved in sailing, fishing, kayaking and of course Coastal Rowing. The Sailing Club was ‘only’ established in 1936 but back in the 19th Century there was a Manningtree and Mistley Boat Club based at Mistley. Rowing featured heavily in early regattas and ‘Water Carnivals’ on the river with extremely closely contested racing (Link here to article ). Rowing (apart from rowing tenders!) faded away for many years, but came back to the Club when members brought the first Claydon Skiff to Manningtree in 2008. In 2016 we set up the ‘Gig Project’ to expand opportunities for existing and new members to take part in competitive and social rowing and applied for funding to buy our first Club Rowing Gig. 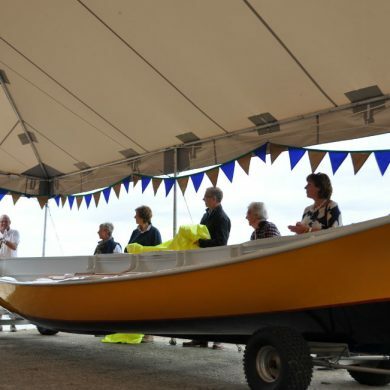 On the 1st October 2016 we launched our beautiful brand new Harker’s Yard Gig William Rose purchased with the aid of a grant from Sport England Lottery Fund. Since 2016 Coastal Rowing at the Club has continued to expand and we are currently competing in our second Harker’s Yard Winter Race Series. If you would like to join us we are always keen to hear from people who would like to row or Cox (and if you want to row then we will also expect you to Cox unless there are good reasons why you can’t!) whether you are currently a member of the Club or not. We row all year round and plan to have two Club rowing sessions most weeks (depending on the tides and weather! ), one during the week and one at weekends, as well as racing. 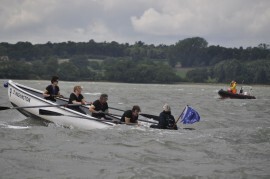 However, all of the Club rowing sessions are dependent on a very small number of volunteers who take rows out – as well as the tide and the weather. Between November when the compound is occupied by Cruisers for winter storage, and April when they go back in the water we are unable to launch the Club Gig at Manningtree. Luckily we also have the use of a Claydon Skiff made available by her owner so that rowing at Manningtree can carry on all year round. The New Gig on the block is Harker’s Yard Gig number 17: William Rose and is the Sailing Club’s first Club Rowing Gig. 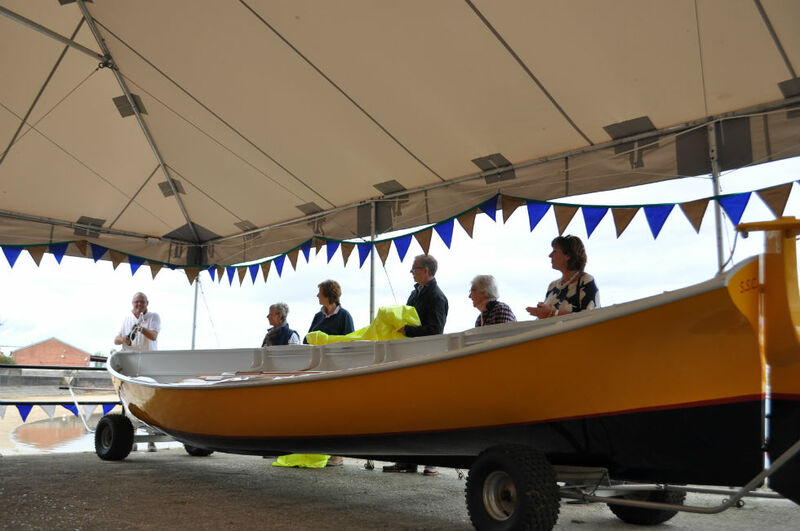 The Harker’s Yard Gigs are sleeker, lighter and faster than the Claydon Skiffs that have been rowed by members at Manningtree since 2008. The new Gig enables the Club to take part in the thriving local racing scene built around the Gigs as well as providing opportunities for members who don’t want to compete to row for fun or for fitness. The Harker’s Yard Gigs are built at the Pioneer Sailing Trust Harker’s Yard at Brightlingsea and are based on a traditional East Coast design. They are twenty four feet long and constructed from 3 layers of cold moulded mahogany and finished in bright colours making them a picturesque sight on the water. The Gigs are built by marine engineering apprentices under the supervision of highly skilled and experienced boat builders. The Stour Sailing Club’s new Gig is the 17th Gig to be built since 2012, and was built by apprentices Josie Webb, Tyler Darvill, Charlie Brockie and Tariq Abdel-Rahim who were all working towards their level 3 apprenticeships in Marine Engineering, working with Gig Manager Liam Hymus. 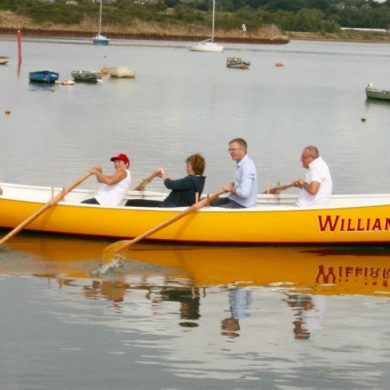 Members of the Sailing Club brought rowing back to the Stour in 2008 in the shape of a Claydon Skiff: “Myrto”, followed shortly after by two more: Witchoar and Lt.Washington. 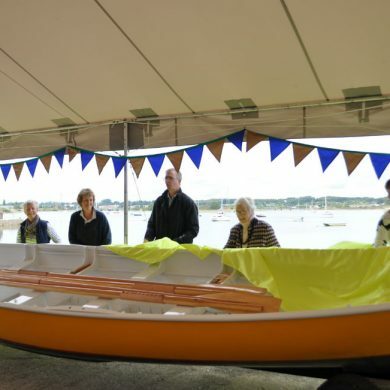 In 2008 the first Claydon Skiff was brought to Manningtree. The boat was originally named “Eadwulf of Walton” and was renamed “Myrto” by her women’s crew at the time, the Manningtree Oars. The name is of Amazonian origins and means a stormy, war like Sea Goddess. As Eadwulf the boat had taken part in the Great River Race in 1991. 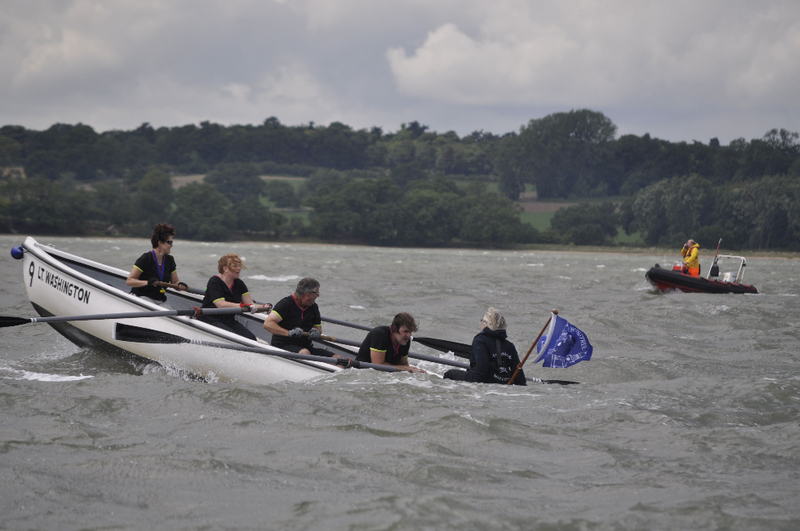 In 2008 the Manningtree Oars once again took part in the Great River Race which is a spectacular 22 mile race on the river Thames held each year in September. 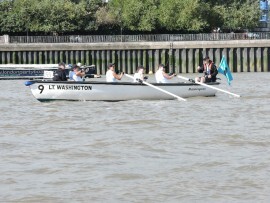 The crew also completed the Great River Race in 2009 and 2010. 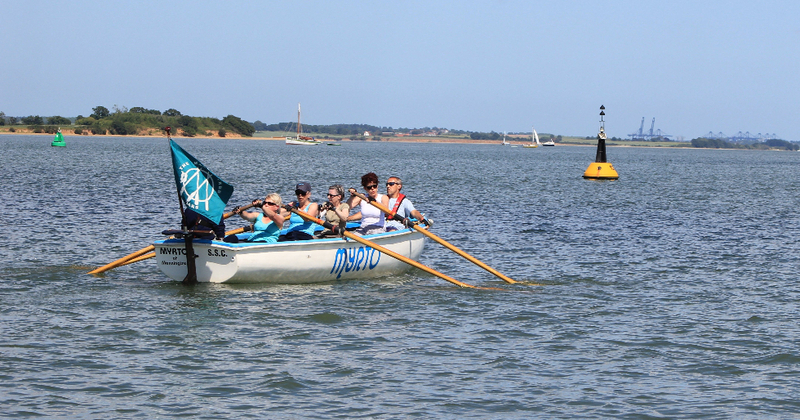 In 2009 the Myrto Crew brought competitive rowing back to Manningtree with the first “Paddle and Oar” festival. A rowing festival has continued to be an important part of the club’s annual programme. In 2012 Myrto took part in the Thames Pageant as part of the Queen’s Diamond Jubilee celebrations, which the team described as a wonderful experience despite the poor weather! 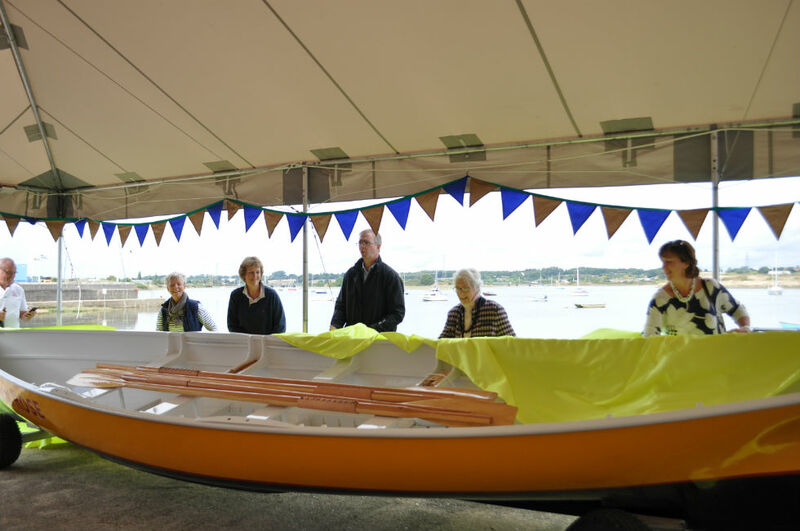 In 2013 the Manningtree Oars set off without Myrto to the inaugural World Championships for St Ayle’s Skiff racing, where they were able to participate in races in a different class of boat. At the end of 2008 a second Claydon Skiff, Witchoar arrived in Manningtree, rescued from abandonment at Levington Marina. 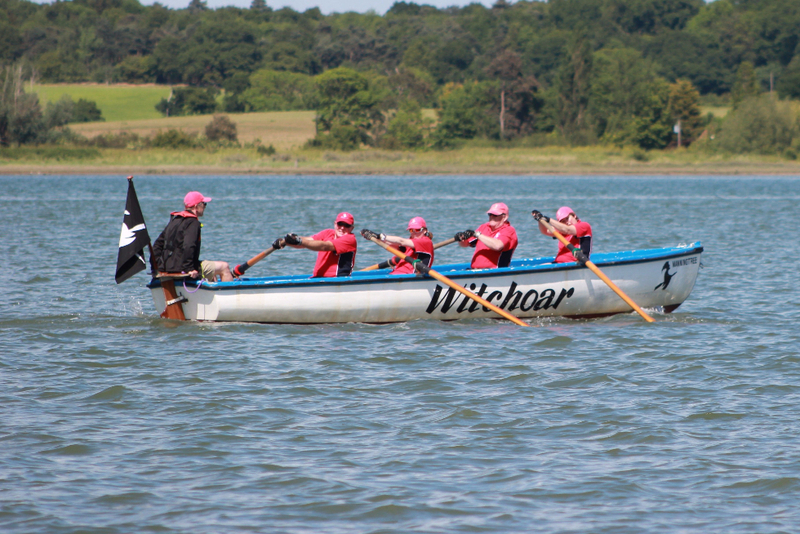 For the first year Witchoar had a men’s crew and first completed the Great River Race in 2009 with a men’s team. From 2010 Witchoar has mainly had a mixed team. The mixed Team completed the Great River Race in 2010, 2011, 2012, 2013 and 2014 setting increasingly competitive times. The mixed team have never been beaten by another mixed team in a Claydon Skiff and beat many men’s teams, but have always just been out rowed by a men’s crew in the Great River Race. In 2015 Witchoar again ok part in the Great River Race with a men’s crew. Witchoar has continued to fly the racing flag for Manningtree, taking part in races and events every year across the region, including the Round Canvey and Round Osea Island Races as well as rowing events at Brightlingsea, Rowhedge, Mersea and Leigh on Sea. Lt Washington was brought to Manningtree in 2009 from Walton by Clive and Jayne Cotton. 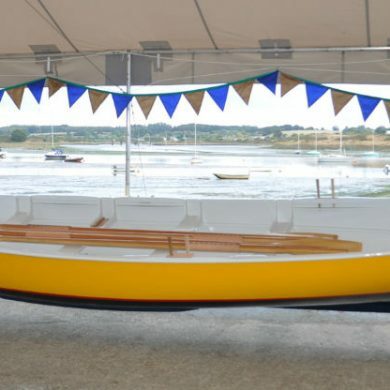 Crewed by the Manningtree Marauders, Lt. Washington took the honours for the fastest Claydon Skiff in the 2009 Paddle and Oar Festival and went on to compete in the Great River Race in 2010 along with Witchoar and Myrto. Lt. Washington holds the record for the most dramatic photograph of a Claydon Skiff in action taken during the challenging conditions for the 2010 Paddle and Oar Festival. Lt Washington was out of the water for a while before changing hands in the summer of 2015. 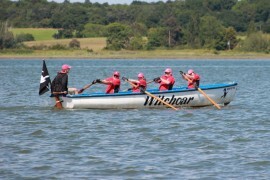 The “girls” from the Witchoar mixed crew recruited a new all veteran women’s crew: the Manningtree “Witches”. With the Witches on board Lt. Washington once again took part in the 2015 Great River Race, with the crew finishing a very creditable 5th in the overall women’s veteran category (despite the “winning” women’s crew being photographed with a male rower en route!). 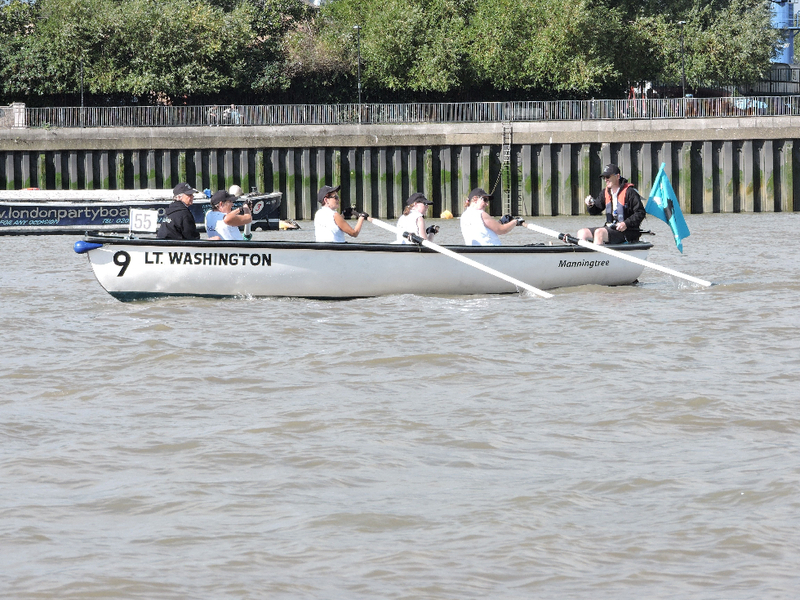 In 2016 Lt Washington once again took part in the Great River Race, this time with a mixed veteran crew. The Crew once again upheld the record of never having been beaten by another mixed crew in a Claydon Skiff and finished as the second mixed veteran crew home in the race overall. The Claydon Skiffs are 22 feet long, fixed seat traditional rowing boats, crewed by four rowers each with a single “sweep” oar, and with a Cox to steer. Built of GRP they were designed to weigh in at around 400 kilos without their equipment and crews. They are broad and stable in heavy water, but also heavy to row, heavy horses rather than race horses but none the worse for that. The boats are based on original oak clinker built watermen’s skiffs designed for working on the tidal reaches of the Thames. Races evolved later and the 1846 Gravesend Regatta featured a prestigious race for apprentices of the Waterman’s Company (The Worshipful Company of Watermen and Lightermen est. 1555) in which the first prize was a fully equipped waterman’s boat, designed to set the winner up in business. Pre-second world war, races included the Long Ferry Race from Westminster to Gravesend which celebrated the fact that until the end of the 18th century the journey was quicker by boat than by road. After the Second World War six new traditional boats were built at Gravesend with money raised by the Town Regatta Committee and these were regularly raced until the 1970’s. The wooden boats were difficult to maintain, and outlived the craftsmen who built and maintained them. They were gradually replaced by the Claydon Class GRP Skiffs that we have today, based on a mould taken from one of the traditional clinker built examples. A few of the traditional Oak Gravesend Skiffs still exist and Percy Sargeant took part in the Great River Race in 2013 with a handicap of 23, one of the first boats away. The Claydon skiffs are only a little lighter than the originals and have a handicap of 27 (leaving four minutes later). In the 1980’s racing continued at Gravesend, with the boats rowed largely by crews from the tug companies and it was this connection that brought the Claydon Skiffs to Felixstowe and Harwich in the early 1990’s. In 1989 a crew from Alexandra Towing Co. (Felixstowe) first took part in the Shrimpers’ Regatta in Gravesend, rowing borrowed local Gravesend Claydon Skiffs. They were roundly beaten by Alexandra Towing Co. (Gravesend). The rivalry continued and in 1990 the crews of the Alexandra Towing Co (Felixstowe) organised a regatta on the river Orwell using five boats borrowed from Gravesend. Participants included Felix Ark Marine ltd, Felixstowe Dock and Railway Co. Firemen, Ipswich Dock Workers and Harwich Port Workers. They raced over a four and a half mile course ending at the Orwell Bridge, with a further race of seven and a half miles down the Orwell to Felixstowe. The local press reported that the event was watched by a crowd of three hundred people and that Felixstowe beat Gravesend in all of the races. The Felixstowe crew went on that year to win the two Tugmen’s cups at the Shrimpers’ Regatta at Gravesend and came third in both the Long Ferry Race and the Great River Race. At this point the Felixstowe crews decided that transporting boats from Gravesend to Suffolk was too expensive and it was time for Felixstowe to have their own Claydon Skiffs. They purchased the original mould (apparently found languishing in a field) and set about a building programme. 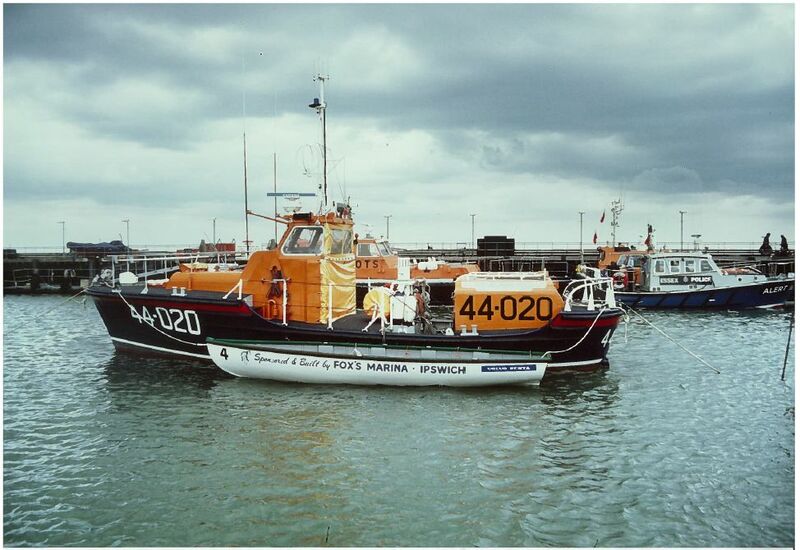 In 1990, the first three “Felixstowe” Claydon Skiffs were built, two for Alexandra and the third for Felix Arc Marine. In December 1990 a meeting was held at the Drunken Docker’s Club in Ipswich to get together people interested in forming clubs or associations to own their own boats to establish the Alexandra Tug Company Rowing Club (ATRC) with the aim being “to provide boats at as low a cost as possible, assist in crew training, and to revive old skills in these replica rowing boats on local rivers”. A press cutting from the East Anglian Daily Times, May 29, 1991 reports the launch of the £3.2m Tug ‘Trimley’ for the Alexandra Towing Company Felixstowe, along with a fleet of five Claydon Skiffs, launched and dedicated by Alexandra and Felixarc companies at Felixstowe, and the Harwich Haven Authority. The Boats were all named after local people and were intended to race to raise money for local charities including the RNLI. 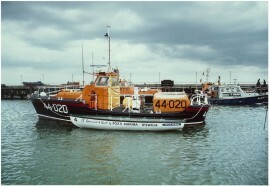 The picture above shows the new Tug with the Harwich Haven Authority boat ‘Viscon’ named for the Chief Executive Captain Victor Sutton and given the number 4. A Claydon Skiff bearing the number 4 is now at Titchmarsh Marina, going by the name of ‘Christopher Jones’. The ATRC organised races locally and a programme for 1991 included a number of events including the River Orwell Tugmans’ Regatta for which a Thames Pleasure Boat was hired for up to 200 spectators. Also included was a Two Rivers Race from Mistley to Ipswich (14 miles). Sadly, it seems that the Tug Companies did not survive as long as the Claydon Skiffs, and although some boats were also raced by Pub Crews and Social Clubs, the number of known boats is relatively small. It is difficult to know the exact number of boats, as many of the names change as they move into new ownership and their numbers are also not retained. However, Claydon Skiffs still have their own category in the Great River Race with one of the grandest trophies in the competition, and around 17 different boat names appear in the entries for the Claydon Skiff class in the Great River Race over the past few years. The owner of one of the Claydon Skiffs at Manningtree owns the original mould for the Claydon Skiffs (once again found languishing, recognised and rescued), and we have copies of the original plans. The possibility of reviving the class remains, perhaps with modern technology allowing them to weigh in at rather less than the build weight of the originals!